The ruby red FS-TA TransAcoustic Guitar from Yamaha recreates an experience without needing any external amplification or effects. 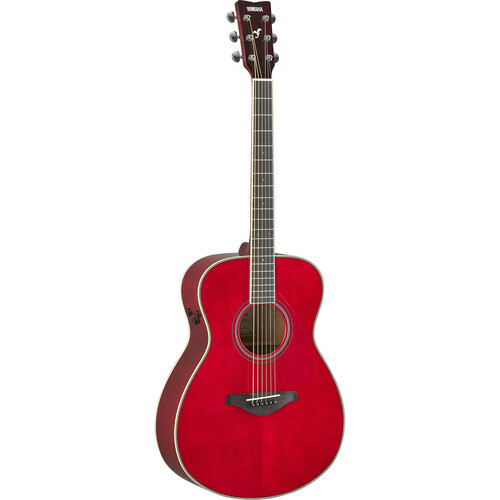 It features scalloped bracing for louder, richer acoustic sound, a solid spruce top, mahogany back and sides, and is built with an actuator installed on the inner surface of the guitar back for a natural reverb and chorus effect. Three knobs allow you to adjust the amount of effects and the line out volume level. By keeping the controls small, it minimizes the area of the holes in the body material, reducing acoustic sound loss. The body is a solid spruce top with mahogany back and sides and based on the FG-series guitar. Louder and stronger sound in the low- to mid-ranges, thanks to cutting-edge acoustic analysis technology, and a newly-designed scalloped bracing pattern. The battery box is now integrated into the end-pin jack. This requires fewer holes in the body and reduces acoustic sound loss. The instrument can also be connected to a PA or amp for use as an acoustic electric guitar. Box Dimensions (LxWxH) 41.0 x 19.0 x 12.0"
Is the battery easily assessable without taking the strings off? The battery box is integrated into the end-pin jack, at the bottom of the the guitar, for easy access without having to remove the strings.